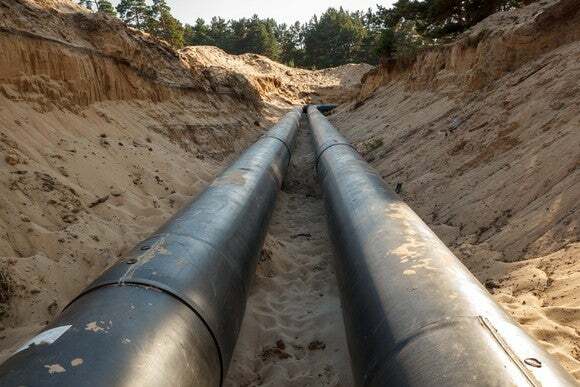 Pipeline and processing company Antero Midstream Partners (NYSE: AM) has quietly flown under the radar of most investors since coming public in late 2014, just as the oil industry was entering a tailspin. That said, while almost everyone's focus was on oil, Antero was busy building natural gas gathering pipelines and other infrastructure to support the expansion efforts of its parent Antero Resources. Those growth projects have already paid big dividends for investors given that the company has increased its payout nearly 115% over that time frame. That said, Antero Midstream is still early in the early innings, which means there's plenty of income growth to come. Antero Midstream currently yields a compelling 4.5%. While that's not as high as many other MLPs, it's still well above the average stock (the S&P 500 yields just 1.8%). Furthermore, that payout is as secure as they come, since Antero Midstream gets 100% of its cash flow from fee-based contracts and will cover its distribution with cash flow by 1.25 to 1.35 times this year. On top of that, it has a low leverage ratio of 2.0 to 2.5 times debt to EBITDA. For comparison's sake, Antero's metrics are better than those of Magellan Midstream Partners (NYSE: MMP), which is one of the most financially conservative MLPs. In Magellan's case, just 85% of its cash flow comes from predictable free-based contracts, while it expects coverage to be 1.25 times and leverage to be slightly less than 3.5 times. That makes Antero's payout all the more attractive when considering that Magellan yields only slightly more at 5%. That said, as good as Antero Midstream's payout is today, it's going to be even better in the years to come. That's because the company is on pace to increase it at a 28% to 30% rate through 2020, with at least 20% annual growth planned for 2021 and 2022. It intends on fueling all this growth with high-return organic expansion projects that it can finance without any outside help. This forecast implies that Antero Midstream will grow its distribution from the current rate of $1.46 per unit all the way up to $4.10 per unit in 2022, suggesting that investors who buy today would be on pace to collect a jaw-dropping 12.5% yield on their initial investment in 2022. Just as important is the fact the company expects to have a comfortable coverage ratio of 1.1 that year while keeping leverage around its current level. What's most impressive about Antero Midstream's growth forecast is that it's unrivaled in the midstream sector. In fact, the next two fastest-growing MLPs, Dominion Energy Midstream Partners (NYSE: DM) and Noble Midstream Partners (NYSE: NBLX), only expect 22% and 20% annual growth through the end of the decade, respectively. Meanwhile, Magellan Midstream Partners' current plan is for just an 8% increase this year. The reason Antero Midstream can deliver a peer-crushing growth rate is that it will earn very high returns on its planned expansion projects. The company can currently build projects at three to six times EBITDA, with 2018's spending expected to be at 4.3 times. To put that into perspective, the $585 million it invests this year on new pipelines should generate about $135 million in annual earnings. For comparison's sake, Magellan typically builds projects at around six to eight times EBITDA, though the first phase of one of its largest expansions was at 12 times, meaning the $335 million investment will only produce about $28 million in annual earnings. Meanwhile, dropdown and third-party acquisitions have been the main drivers of growth at Dominion Energy Midstream and Noble Midstream. That's noteworthy because they typically cost eight to more than 12 times EBITDA. Given that difference, Antero's investments are moving the needle further than those of its rivals, which is why it's on pace to grow at a much faster rate. Antero Midstream should be on the radars of income investors if for no other reason than it pays a well-supported distribution that currently yields an attractive 4.5%. However, that lucrative payout is only the beginning, as it's on pace to expand at breakneck speed in the coming years. That sets the stage for the company to potentially deliver market-smashing total returns, because its market value should increase alongside the payout.